During the development of Siralim 2, we also began working on a physical, collectible card game based on the original Siralim video game. Ultimately, the idea was scrapped for reasons that won’t be discussed here. 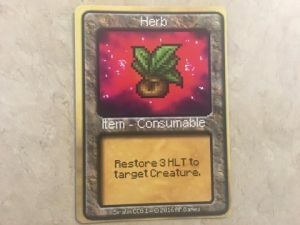 However, a lot of people have expressed interest in a potential card game so I thought it might be interesting to show off the prototype. Before I begin, I want to reiterate that this card game will never be released. It’s possible that a digital version of it might happen someday, but I have absolutely no plans to release anything like that for now. This post is merely to show off the prototype for this game before it was ultimately scrapped. 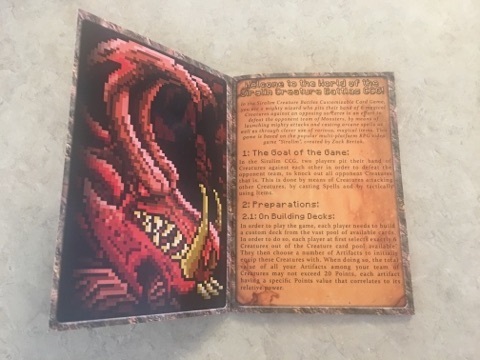 The entire game was designed by our former graphics artist, with concepts taken from Siralim and Siralim 2 including creature traits, artifacts, and other key gameplay elements. Let’s start with a brief explanation about how the game is played. 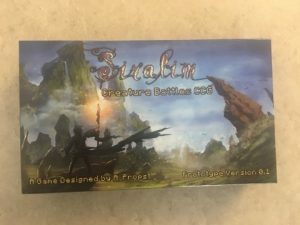 The Siralim CCG (Collectible Card Game) is a 1 versus 1 card game that pits your creatures against those of your friends. To win, you’ll need to defeat all of your opponent’s creatures. 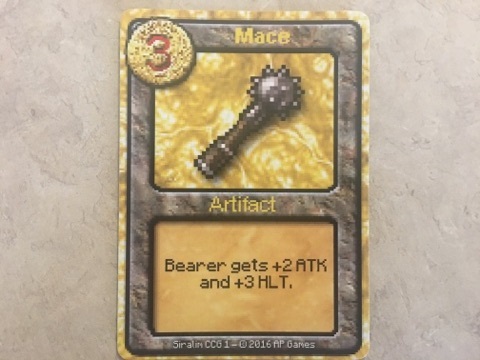 Just like in the video games, you’ll need to create a party of creatures that work well with each other based on their traits, and equip them with suitable artifacts in order to gain an advantage over your opponent. 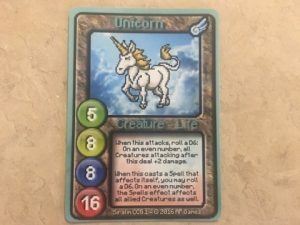 There’s one creature card for every creature race in Siralim 1. 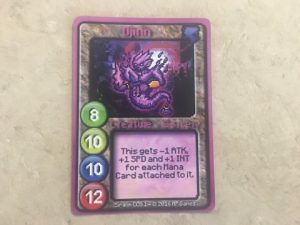 For example, instead of having multiple creatures that belong to the same race such as the “Diabolic Henchman” and “Diabolic Observer”, the CCG instead only has one creature to represent this race: the “Diabolic Horde”. Your deck will contain exactly six creatures of your choice, along with an accompanying artifact card for each one. Next, you’ll need to fill out your deck with a bunch of items and spells to attain a total of 50 cards in your entire deck. While many of the spells work similarly to those found in Siralim and Siralim 2, the items were created from the ground up – specifically for the card game! 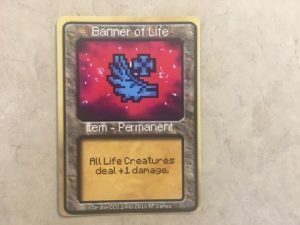 Some items are used to empower your creatures with increased stats, while others are used to cure a debuff or recover some of your creatures’ Health pools. Once both players have their decks built and are ready to play, a coin is flipped to determine who goes first. Both players take turns iterating through the four main phases of gameplay until one player runs out of living creature cards. The first phase is called the Replenishment Phase. Most actions the player takes – including attacking or casting a spell – requires a certain amount of Energy. During this phase, the player’s Energy is restored. In addition, certain “Beginning of Turn” effects can occur at this time. For example, true to their functionality in Siralim, the Troll causes damage to a random enemy creature. The second phase is called the Draw Phase. 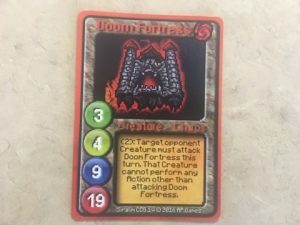 During this phase, the player draws enough cards to hold a total of seven cards in their hand. Simple enough. Next comes the Main Phase. 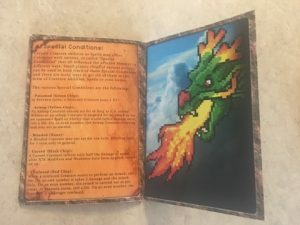 This is when the player can choose an action for each of their six creatures. 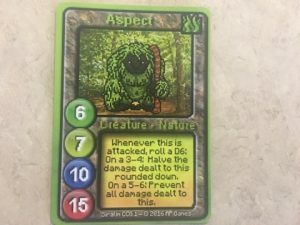 Creatures can attack, use an active ability (trait), cast a spell, or simply do nothing at all. 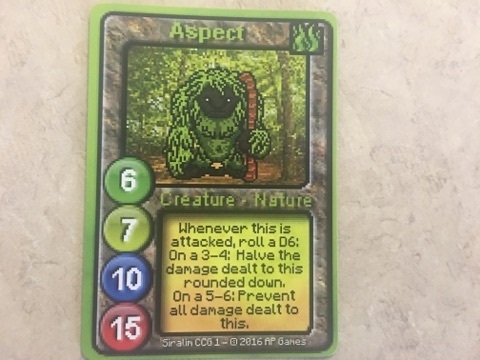 Generally, each creature will only have enough Energy for one action per turn, but certain spells and other effects allow some creatures to take multiple actions per turn. Lastly, we have the End Phase. Nothing too exciting happens here – some “End of Turn” effects occur and that’s about it. 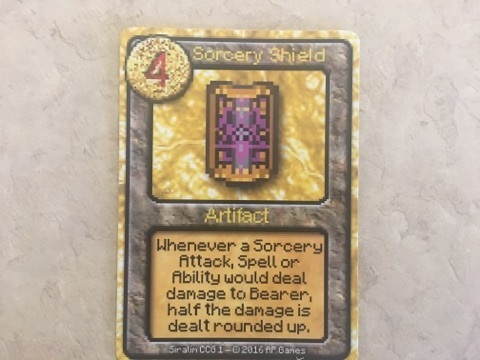 Attack damage, spell damage, and the effectiveness of certain traits and items are affected by the creatures’ stats. 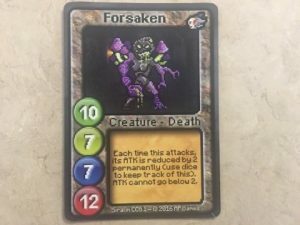 There are four stats in the Siralim CCG: Attack, Health, Speed, and Intelligence. 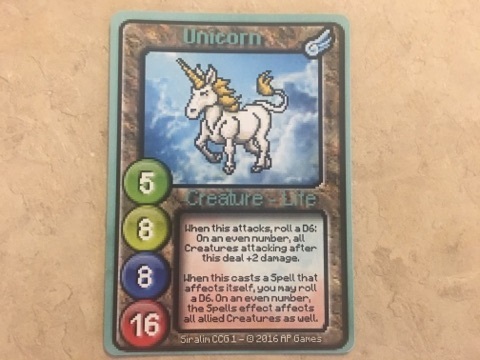 These stats are listed in order from top to bottom on the left side of each creature card. Attack – determines attack damage. Health – when a creature runs out of Health, it dies. Speed – determines the order in which the creature attacks during the Main Phase. Intelligence – determines the potency of spells the creature casts. 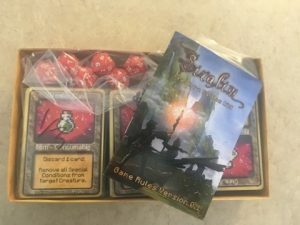 As I said before, both players take turns attacking, casting spells, and using items on their creatures until one player’s party is completely wiped out, with the surviving player being the winner. Some effects require the use of tokens (to symbolize the game’s debuffs: Poisoned, Asleep, Blinded, Cursed, and Confused), while others make use of dice to calculate effects that deal with randomized numbers. …and that’s about it. There are a few other minor details associated with the game, but that’s pretty much the gist of it. For that reason, this card game didn’t turn out to be anywhere near as fun as the video games, which is one of the many reasons why this project was cancelled. It’s entertaining enough for a few matches, but it’s definitely not something you’d want to play in the long term. 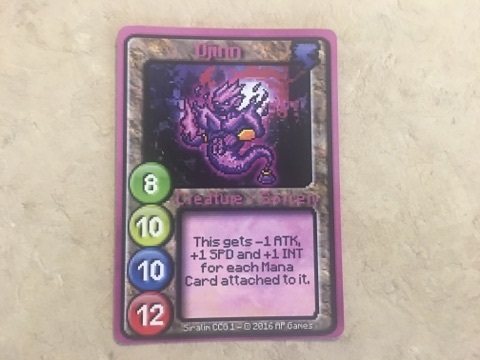 I’ll leave you with a few more pictures of some other cards. Notice how the creatures were all designed to work the same way they do in the video games. As the title states, Thylacine Studios now has a brand new website! The most notable improvement is the addition of a blog – the one you’re reading right now. I’ll use this blog to not only keep you up to date with development on my own games, but to also bring you game dev book reviews, tutorials, news, game analyses, and much more. I’ll also start integrating social media and other forms of communication into my daily routine in order to keep in touch with the playerbase better than ever before. If you run into any bugs with the new website or have any suggestions, please let me know. You don’t have to sign up or do anything special to leave a comment, so feel free to reply to any post you want! If you’ve already signed up on our forums, you can simply re-login on the forums and you’ll be able to post here using your username. Please note that first time posters need to wait for approval before their post appears. Oh, and one more thing: make sure you sign up for our Newsletter by scrolling to the bottom of any page on the site. This is the best way for you to stay up to date on our game announcements!